The pretty bathroom that we added onto my daughter’s house a couple of years ago has been finished for sometime, with the exception of some reclaimed wood shelves she had always wanted to add. We spent some time researching reclaimed wood, drove to a salvage business in downtown Los Angeles, and found what might be a good fit. Then, as other projects moved forward, the salvaged shelves were put on hold. Finally, the wood was purchased, and the shelves were added to the area above the commode. My daughter wanted this rustic look to relate to the natural weave of her laundry basket and to add some relief to the fancy turned legs of the reclaimed dining room buffet we made into her vanity with the addition of a vessel sink. The beautiful faucet set and vanity, along with the custom tile band for the shower, are the show stoppers in the bathroom. The ceilings are tall in her 1930s Spanish home, and my daughter felt the commode area needed a little special attention. She added the stenciling on the commode wall for a little sparkle, which adds to the elegance of the rest of the bathroom; the rustic shelves are a juxtaposition to this design element. Dressing the shelves was the next project. We found a fun little wire basket at the “Junk Bonanza” in Del Mar a couple of weeks ago in which she could store her spare bath towel. Then she added some of her favorite things from trips abroad and down under. The memorabilia are a nice reminder of fun trips and outings with friends and family. Additionally, we picked up some fun pieces during our salvaging outings. We picked up vessels for planting succulents on the patio along with an old bedspring she will use as a planting screen for added privacy behind her outdoor patio furniture. I will share more about these and other items in another article, so stay tuned for more of our salvaging exploits. Most people sooner or later, will get into a decorating rut. They put the same things in the same places, either because they like the arrangements or are just too intimidated by the thought of changing. I have been guilty in both cases. Sometimes the geometry of a space dictates what will fit or create a reasonably balanced setting. Other times, why change a pleasing setting? Small changes can occur with seasonal decorating, and that is change is enough for me, as long as everything else suits. I always suggest to clients to live in a space for a time to see how the space will work out for them, practically, to see how their life patterns will develop. I am reminded of one of my earliest design instructors telling us how a New EnglandLandscape Architect allowed the pathways of a major University to be developed naturally, that is he allowed the students walking from class to class to set the pathways before setting them in stone. What evolved was a pleasing and sometimes meandering paths, while other pathways were direct— that’s human nature. It was just like seeing the paths blazed by the animals in the wild. Moving forced me to consider what to save and what to let go— not an easy task, I admit. The next step was to decide what artwork, family pictures, and the like would go where. This decision-making took a bit longer than I expected, but then emptying boxes and finding space for what was most important took even longer. More editing! As a family, we have grown attached to many things. Some, while not great pieces of art, are important to our family’s history. We all tried to remember where the five large Sunset posters had hung when our family was very young. Thank heavens for the stronger memory banks of our children. We sold a couple of the framed posters that our kids grew up with, more than 40 years ago, and we had several hanging in the home we had for 30 years. It was gratifying to know that two young couples furnishing their first home, coincidentally enough, the California Craftsman style home that was our first home, were happy to hear our family’s story about the posters. We are now down from five posters to two. The placement of one of them in the bathroom may seem odd, but why not the bathroom? It feels fresh and fun. Another grouping of framed art, is a set of three sketches of my husband’s first trip to Europe, on a cycling tour. He turned 16 in a Paris cafe and met up with an artist from the San Fernando Valley— small world indeed. After storing the sketches in a drawer for many years, I had them framed; they have hung somewhere in our home ever since. This house is much smaller than our previous one, so I have had to think of ways to get our favorite pieces to fit and make some sense of what might be considered a diverse collection. The three Paris sketches have made the cut and landed in the TV room. Another important collection was of my father, as the “Fire-Fall” man in Yosemite National Park during his youth in the 1920s. The pictures were always a treasure to me, because of the stories he told of those daring times. Pictured in the background is Half Dome, and there are scenes of him in his cabin, under what had been the Glacier Point Hotel, high above the valley, where guests of the Ahwahnee Hotel would marvel at the fiery logs being tossed over the falls. I decided that the scale and coloring of both these two diverse collections could work together, since the black and white sketches were framed in a similar wood and style as the Yosemite photographs, which are in a sepia tone. We have decided after much thought that this was a good choice, although not quickly made. If you are moving, you certainly will be challenged with what to keep and where to place your things, but do not be hasty. Even if you are not moving, but are tired of your current displays, I say take them down, sort through what you have, keep only your very best and favorites and then find new places for them. You will find it is refreshing to have familiar things in new places. The house we have recently moved to is what you might call vintage; it was built in 1938. It has many great features; and over the years, some of the features have changed and others have remained the same. I am certain the master bathroom has seen some remodeling; however, unlike other improvements in the home, the bathroom could use another refreshing. We plan to make some changes in the near future, but our most important issue after moving in was privacy. A prior owner had used a spray giving the window glass a frosted look with a clear border. This solution seemed to be a good enough for the tenants who occupied the home while we were preparing to sell our home. However, the last tenant removed the frosted part on one window, and the children must have picked away at the other window leaving it less than attractive. Once we moved in, we needed the light, but needed the privacy more. I had purchased some temporary blinds, and we lived with them for a couple of weeks; but I could only tolerate that for a short time. In the mean time, I had been thinking of an inexpensive solution that would be attractive enough, private enough and easy enough for the short term until we make some major adjustments to this bathroom. On a previous trip to IKEA, I had seen a new pattern of sliding panels and was thinking of different ways I might make the panel work for me. The panels are only 24 inches wide, and fortunately the bathroom windows are about the same size. The upper portion of the double sash windows provide enough privacy because of foliage outside, but the lower half was my concern. I did not want to install the sliding frames that are available for these panels, but did want to keep the project simple. I purchased small, slender, cafe curtain rods easily found in just about any hardware or big box store. To give the panel some weight to hang properly, I purchased one- quarter inch steel dowels, and sewed a pocket on the top of my fabric and bottom of my panel fabric; slipped the curtain rod in the top and the steel dowel in the bottom; gravity did the rest, pulling the curtain down snuggly to the window sill. One of the reasons this was so easy and simple is that the fabric edges, a poly or plastic of some sort, will not fray; so there was no finishing to the edges, as there would be with other fabrics. I liked this grid or checker pattern because it lent itself to a country or more modern style. I had enough fabric left to do a similar treatment on the back door window that gives both our neighbor to the north, and us a bit more privacy. 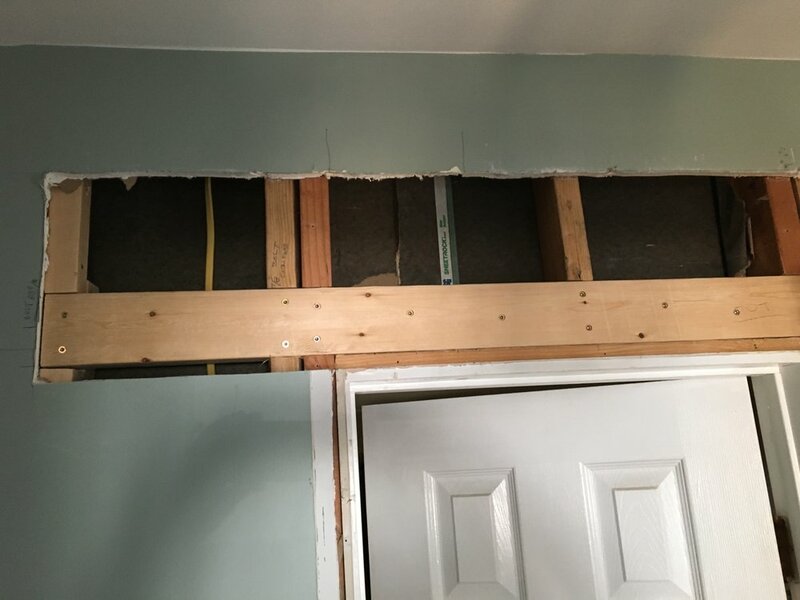 The only change I made in the construction was to fix the same type of rods to the top and bottom so the bottom was firmly fixed, and would not bang on the door every time the door opened or closed. With the bathroom windows, this was not an issue and, having the bottom of the window blind not fixed, makes opening the windows in the bath room easier. Covering three windows for under $30 feels like a good deal to me. I saved my dollars for the kitchen and dining room windows and went with linen top-down and bottom-up blinds that allow light and privacy, a win, win. This is one of my favorite times of year because the Pasadena Showcase House Tour is running through May 17th. I have been visiting this showcase for decades and always marvel at what designers can come up with in new and inventive ideas of the designers; I do not always agree with what I see, but I usually come away inspired. This year was no different; there were some likes and some not so much. One of my favorite rooms was the Artist’s Retreat. I nearly gasped when I saw the quiet color palette, the same palette that I planned for my new office, and some of the same materials. The designer who was responsible for this particular room, used very expensive oak planks on the walls and spaced them tightly together, while my plan is to use wide pine planks with a shiplap look instead. Cost is always an issue for me. I loved the use of cork for the floors, they actually looked like travertine. I had planned to use travertine, but I think cork is the way to go. With advances in the use of cork, you can find it in a variety colors. You can mix and match to create designs such as the harlequin pattern in this room. Cork is warm, quiet and renewable, therefore a very “green” product. Another take away from this year’s house was the liberal use of Edison light bulbs. No doubt you have seen them in many magazines, brochures and other advertisements. One of the designers commented that the Edison lights used in the room he designed were from a local and well known lighting shop—Lamps Plus. I guess even showcase designers have to find savings where they can. Edison lights were used throughout the house in a variety of designs from industrial to elegant. The color palette for this year’s house has some of my all time favorites and some new colors from Dunn Edward’s newest collection that I have already used—it is good to know I’m on trend. There were some pretty bold colors but they were well balanced in the private rooms upstairs where the family stayed, while the more public rooms were much more neutral but had accent colors repeating some of the bolder colors used upstairs. I found it to be a good exercise in the use of the color palette keeping it unified without creating a rainbow effect. As I mentioned, there were some “misses” for me. I felt some of the bathrooms were a bit overdone with the use of stone, and I love stone in a bathroom; but I felt there was too much pattern conflict. There certainly were a lot of bathrooms to choose from, something for every taste, and I had some favorites there too. You can go online and see some of the photos from the Showcase House, this year and past years; but if you have a chance you should go and see it for yourself this year’s Tudor style house designed by Fernand Parmentier in 1910. There is always something gained, besides the benefit to children’s music programs throughout the community that the Showcase House funds. China cabinets have been a subject in my column before, I know, but this topic has a new twist. Most china cabinets new and old come in two pieces; that is, the top or glass portion is usually a bit narrower than its base and secured by screws and possibly a bracket to hold it all together as one piece. Years ago, I had a friend ask me what she could do with a piece she had inherited from her mother, a piece she really didn’t want, or need, but “Mother wanted me to have it”; so the need to keep and use it was strong. My immediate idea was to take the top off (storing it until a use could be found for it) and to just use the base as a buffet, which is what my friend did. The buffet sits in the dining room with the matching table, and the room is no longer overwhelmed with too much furniture. I had suggested that if they had space in a bathroom, a metal base frame could be made for the glass portion and the piece could be painted and used to store pretty towels and toiletries. The base being open, would not overpower a small room. However the home really did not have space for. Oftentimes, an older home ( 60 years or more) might accommodate such a piece. Now, this friend is refurbishing a home that is from the turn of the last century, and I got to thinking about the upper cabinet piece that hopefully being stored. The piece might be a perfect solution to furnishing a century-old home, in either the kitchen or bathroom. In the kitchen, it could easily sit on a counter top, making it look somewhat built-in, painted to match the base cabinet. This situation would not have been out of the ordinary in those days, as pioneer folks really did use what they had or could find in a neighboring farmhouse. Mix and match became a design trend; but back in the day, it was simply a way to make ends meet. It’s funny, how somethings come full circle. Alternately, this upper cabinet piece could be a great linen cabinet upstairs in the bathroom or hallway near the bath. Again, it could be placed on top of an old dresser and secured to the dresser with brackets, or fastened to the wall as a permanent piece. Depending on the decor sensibilities of the room, the pieces can be painted a fun color to enhance the bathroom, as an accent piece or painted to blend into the walls. Bright colored towels can provide the accent color. If the glass has broken in the storage or transportation, a mesh or chicken wire can replace the glass. Painted a silver, gold or black to match the other fixtures in the bathroom or kitchen to give it a true “farmhouse” feel, along with new handles or cabinet pulls. Of course, both pieces could be re-united and painted and placed in the old farmhouse and given new life in a new space with a outlook for another hundred years. There is usually a solution, if you can keep an open mind and are not in too much of a hurry for the finish line. Remember that decorating is a journey; have fun along the way. Whether you are remodeling or building from scratch, tile in the bathrooms and kitchen is a good choice. While solid surface countertops still reign superior in most homeowner’s minds, the backsplash is another thing entirely. Tile and stone pieces are a great option. Stone pieces and mosaic tiles are usually mounted on a mesh backing, making installation much easier than was the decades ago fashion of placing the pieces one piece at a time. In showers, more often than not, I am seeing tile or mosaic stone being used from floor to ceiling for a continuous look. This process eliminates peeling paint in very moist environments. It is also a cleaner look from a design aspect. Allowing tile to reach the ceiling, gives you some more options for adding a design element, such as running subway tile in a vertical pattern, or alternating colors into vertical bands to give the room a greater appearance of height. Running several contrasting horizontal bands is another design option. In small spaces use less contrast, but enough to add interest in what might be a dull and uninteresting space. In kitchens, where you use tile as a backsplash behind a cooktop, you can create again a greater sense of height and you can highlight a fancy hood vent. If you have a sink that does not overlook a window, adding an attractive tile with open shelves will feel less closed in than having cabinets above the sink. This area can become a focal point for displaying some of your favorite decorative pieces or most-often used dishes and bowls; if they are colorful or unusual, they are not only useful, but pretty additions to the kitchen decor. Open shelving in kitchens over a counter-to-ceiling wall of interesting tile can add special interest while allowing for storage and display options. In an eating area, where the kids sit, might be a great place to store materials that they can access easily, especially in a space-saving banquet area. There are so many choices when it comes to wall tile. Stone, glass, porcelain, and ceramic tiles are available in smooth, metallic, clear, solid and tumbled finishes. I like to remind clients to consider the relationship between the counter and the backsplash choices, which need to be coordinated in both color and patterns. Too often, clients choose a speckled countertop that may have a lot of color contrast, which they love, but then choose an equally busy backsplash over the counters; and are not usually very happy with the finished look. It is best to choose one or the other to be the big splash of design or color contrast which is not to say you cannot have a dash of contrast in both places; but you need to use some restraint in one place or another. When you are considering using a piece of furniture as a bathroom vanity, there are a few things to consider. Drawers were the major concern with the sideboard piece we selected for our vanity in the new construction bathroom in the vintage house about which I have been writing. Drawers also may be a consideration for you, but you may have more drawer space to spare than we did with the sideboard, which was limited to two drawers. We did consider the drawers when we first looked at the piece and hoped we could have some use of at least one of the drawers. The engineer was able to allow for partial use of both drawers-- an added bonus. Once the vessel sink, and the faucet set arrived, the engineer was able to collect the various plumbing pieces needed and worked on construction of the drawers. Using plywood, he was able to build a series of boxes that would accommodate the necessary plumbing and still allow for some interesting drawer space. As you can see from the pictures, both drawers were compromised for the plumbing, but there is still quite a bit of useable space for useful storage. With some modular vanity boxes for make up or jewelry, these drawers will function quite well. The two cabinets on either side of the drawers will store a hair dryer and various curling irons and other necessities the lady of the house will need. The sideboard was not the least expensive part of the project, but it was a close third. The vessel sink was quite affordable, and looks great. The knobs were re-purposed from the kitchen and original to the house, so they cost nothing. A few shiny new screws and a good clean up was all that was needed to make the knobs sparkle and add a touch of history to the piece. Without a doubt the faucet set was the big expense; but in the end, it is so elegant it was considered, well worth the price. The vanity was installed last weekend and it looks stunning; all parties are pleased with the outcome. There are some practical things to consider with this piece, first of all, having a wood top is not the ideal surface for a vanity, a stone top would be more durable. This homeowner knows the problems associated with a wood top and it will be up to her to maintain the surface by making sure any water drops are quickly wiped up. While there are many, many coats of finish, it is still a good idea to keep the surface dry; I suggest a wipe up towel inside one of the cabinets for easy and quick access. The vanity is certainly the showpiece of this lovely new bathroom. The new-build bathroom is taking shape. The next thing to do is install the tile on the floor and shower and, since that will begin next week, I thought I would talk about some of the saves and splurges, what to look for and how to save. In this particular house, there was a custom window in the bedroom space where we wanted to put a pair of French Doors. Trying to save as much of the budget for other things, we decided to re-use the window in the bathroom--a big save. It is a rather large window, but it overlooks a particularly pretty floral garden and patio, so we felt it was a good move. My client had to purchase a custom window for a wall in the new bedroom extension to match an existing window, and not having to buy two custom windows made good sense. Having a large window in the bathroom made for some challenges for the vanity, described in earlier articles; the placement had to be fairly low to be level with the height of the vessel sink. The length of the vanity also had to match the width of the window, so this furniture piece turned out to be truly perfect fit for a vanity. The cost of the vanity was another big save. Finding an acceptable faucet set for the vessel sink turned out to be more of a challenge that expected; after all, vessel sinks seem to be quite popular. However, we did not find anything that met the criteria in the home centers, so we explored higher end retailers. This purchase turned out to be one of the splurges we had been saving some of the budget for; but beauty has its price. Since the vanity is the real focal point of the bathroom in this instance, my client wanted it to reflect a certain elegance and grace. The shower fixtures, while important, will not be so much on view as the sink, so those fixtures were a little less spectacular in both cost and aesthetics; however, they are made of a good quality metals instead of more standard plastic that most of the home centers offered-- another save. A special feature was the accent tile in the shower. Since this house is of an older and particular vintage style, we headed to Mission Tile in South Pasadena and, decided on a classic design in custom colors that will remain timeless. While this could be considered to be on the splurge side of the ledger, the area was small and the cost was minimal. Of course, we could have chosen something from the home center, and the cost would have been less, but the effect would have been less as well. There are still a lot of details to attend to before we can call the job finished, but the major expenditures are in or nearly so. Hopefully, this project will be finished in the next couple of weeks, and I can share with you some of the photos of the completed bathroom. The search for the perfect bathroom vanity set my client and me on a journey to the flea markets at Pasadena City Collage and the Rose Bowl, into Orange County’s antiques streets and up to Main Street in Ventura. Along the way, we were able to fine tune exactly what was needed to fit the space available and satisfy my client’s aesthetic sensibilities. Keeping an open mind helps you find something and adapt it to your needs as opposed to having something custom built and incurring the additional cost. It is important not to become discouraged when you head out on your search, because what you have in your mind’s eye is not likely to be found in the world of existing products. My client had established the hard surface finishes, which are stone and tile; so she was looking for some warmth in natural wood for her vanity-- that is, not a painted piece. Of course, a found, usable vanity could be stripped and refinished if otherwise worthy. We didn’t have any success at our first weekend out, which is not unusual. However, when we hit the Rose Bowl, we were amazed to find a great, aesthetically pleasing dresser at the first stall we saw. We especially liked its large, round mirror; usually mirrors attached to dressers are oval. Even the color was perfect, had she wanted a painted piece. The design added to its feminine appeal. We assessed the piece with a practical eye: how much work it would take to add a vessel sink and the necessary plumbing, and how much drawer space would need to be sacrificed. The vendor took our cell numbers and we moved on. Our second find determined that a dining room server or sideboard might be a better choice. We determined the central top drawer might be sacrificed for plumbing, but the side cabinets would be perfect for keeping curling irons and a hair dryer for easy access. We especially liked the turned legs of the piece adding to the feminine quality. Unfortunately, detail work lost over the years needed to be replaced by a furniture restorer, ultimately adding to the cost. The last problem was that the piece was painted; beautiful mahogany wood, but the missing detail work was key, so we moved on. Our last option at this site was a pretty Bird’s Eye Maple dresser. We loved the wood, but the piece was pretty plain and the top was damaged, so more work or a stone top would need to be added, increasing the cost. The search continued the following week into Orange County. Because we had little time and had honed in on what we wanted, we looked at a more limited number of pieces; we found only one piece to seriously consider, but it was costly, and reviewing our “option” pieces, we passed on it. The next day we headed up north to Ventura, and BINGO! We found the perfect server piece. A previous owner had cut the legs down, so it was low enough to accommodate a vessel sink and, we didn’t have the anxiety of doing it ourselves. It is narrow in depth, which suits the available space nicely, and was not painted. It did have decades of old stain and no doubt a variety of oils and grime on the surface, but that just means it needed to be stripped. The stripping down part was going to be messy and time consuming, but the price was negotiable, and that made it very appealing. Unfortunately, the most effective stripping agents have been eliminated by the EPA over the past several decades, so the process is more lengthy. If you do not do it yourself, stripping can be very expensive. In the end, the search process was fun and, as usual, educational, as we fine tuned what would work best. The stripping continues, but we are convinced that the search was successful, and it will become the perfect vanity. There are so many places in your home in which you can show off your quirky or whimsical side. I prefer the less obvious places where these little touches are subtle and give people a chance to determine if they really did see something odd or not. My son has been going through his 1970s house and making it more about him and his lifestyle rather than about the very ordinary style of the previous owner. When my son asked for some ideas for his outside lighting, I sent him a fairly large variety of styles that would enhance his exterior. When he saw the Gargoyles, he naturally loved them, but thought, “this must be a test”; after looking over all the choices, he selected a few and sent them back to me, but asked about the gargoyles: was I really serious or was it a test? While we appear to be a fairly plain and possibly dull family, we have our quirky side and express it differently; Gargoyles are part of that quirky side; you will find several around if you know where to look. When my son posed the question, I told him to go for it; it suited him, and with a click of his computer mouse, he purchased a pair for the front of his house. I did caution him not to overdo it, and to limit the Gargoyles to the pair. He chose something similar for some other areas that needed lighting at the front of his house, but the back deck is completely different with a different vibe going on there. Lighting is very important to a home’s function and style. Most overhead lighting is not particularly useful for tasks that we need to perform in a given room. Table, floor and desk lights are more suitable for performing tasks, while track lighting is great for a dark hallway where you want to create a gallery wall of art or photographs, or just light the way in an interesting fashion. Track or cable lighting is also useful in small rooms where there is limited space for table or floor lamps. These inventive lights come in hight and low intensity, and they are very directional, giving you light where it is most needed. Track lights can be very unobtrusive as well. Cable lighting is particularly good in spaces where there is concrete construction, like in old loft spaces or newer condos. Chandeliers have become big business in recent years, and people are using them in more unexpected places. I applaud their use, but make them fit with the style of the room; and make sure they give you the light you need. For instance, a pretty chandelier in a powder room is perfect, but in a bathroom where you need to shave or apply make-up, you will need more serious task lighting. Add some sconces to either side of the mirror for more effective lighting. By all means, add sparkle and whimsey whenever you can. While it is true that high contrast will add drama to a room, it is wise to consider how you use contrast. A painted accent wall is fairly easy to change should you decide you cannot live with the drama the color created, but a floor or a tiled backsplash or shower enclosure is a bit more complicated in terms of expense and time invested. When you are considering changing something more permanent in your home, like flooring and counter surfaces as well as backsplashes and tub/shower enclosures, try less contrast. You will be living with these changes for a long time and a classic surface in these areas will serve you better. Think of all the homes built in the early to mid-20th Century; for the most part, these homes were built with hardwood flooring. Over the years, as wall to wall carpet became popular, these floors were covered with soft, colorful carpet. Today, that carpet is considered undesirable and old fashioned. Carpets in older homes are routinely being pulled up, exposing those now treasured hardwood floors. If the wood is in good condition, a simple sanding, staining and fresh coat of polyurethane to preserve its beauty for another half century or more. Choosing a new color for the floor will be important and fairly permanent. While it may be tempting to add or stain a border or pattern, think in terms of long term use and how you will feel about such a contrast as a wide, light or dark border verses a solid-colored floor. An exception to this rule, would be if the floors cannot be successfully refinished, but can be painted instead; then I’d say, go ahead and paint a fun harlequin pattern or boarder. While the traditional black and white pattern is always popular, you can use softer colors for less contrast, like shades of grey or spa colors like blues and greens; even shades of beige would be a calm and peaceful color combination. Tile and natural stone is an expensive and fairly permanent surface for kitchens and baths. Tempting are the bright colors and fun patterns, but again, consider how long it will be in style, staying classic is wiser. Unless your home is clearly in a particular style like a Spanish Revival or Spanish Colonial, the use of colorfully patterned tiles might be a bit risky. Adding cute “accent tiles” to a kitchen backsplash will date your renovation very quickly and reduce its value at resale time. If using these colorful and playful tiles is something you have your heart set on, use them in less permanent ways. For instance you can make tile trivets and hang them on the backsplash to add some personality without risking the need to tear it out once you tire of it. When considering high contrast, think about how long you will live in this home and consider the home’s style. High contrast will give you high drama, but you can enjoy soft contrast too and it is often easier to live with in the long term. For many of us, painting natural wood is considered either difficult or forbidden; these views are understandable and have been handed down for generations. In the past, people did not paint furniture of good quality and workmanship; it took valuable time and resources to do so; in Victorian times, it simply wasn’t done. As furnishing were passed down, they may have been revered as family treasures, and to paint them would be to dishonor them. As these pieces were passed down further, such feelings became less important and more distant; and painting was more acceptable and in vogue. Not much has changed today. Pieces that hold fond memories from a favorite aunt or grandmother still may be left untouched. However, if you have such a piece, have grown tired of it, but still can’t part with it, and know that the next generation is not interested in it, why not consider giving it new life and paint it? Painting often is dismissed as a solution because it is considered time consuming and difficult; thoughts of stripping the piece are shunned. It is true that painting is time consuming, but painting is not so difficult; taken step by step, it is really quite easy. If you consider it boring, plug in a book or your favorite music on your CD player; being entertained while doing a task you have been putting off, makes it enjoyable and a new hobby might be born. Once a piece has reached the end of its life cycle for me, I think first of reusing it in another way or place in my home or yard; doing so usually involves recovering the fabric portion or painting the piece, sometimes removing or adding ornamentation. If I can’t reuse the piece, I offer it to a family member; if there are no takers, I move down the line, friends, associates and charities. I remember my mother-in-law telling me how exciting it was when painting furniture was in vogue. Living with furniture from previous generations was oppressive; such furniture often was dark and dated, and the freedom to paint it gave the family a lift, like coming out of a depression. The pendulum swings back and forth in both fashion and interior design. We experience it daily in print and television shows, as we see what was old is new again. Take, for example, the renewed interest in Mid-Century Modern and the juxtaposition of a Victorian piece, or the mod-textile prints popular in the 1970’s, placed in a more contemporary setting. In some cases, a little paint and color can go a long way. Today there is a plethora of colors as opposed to what was available a few decades ago.